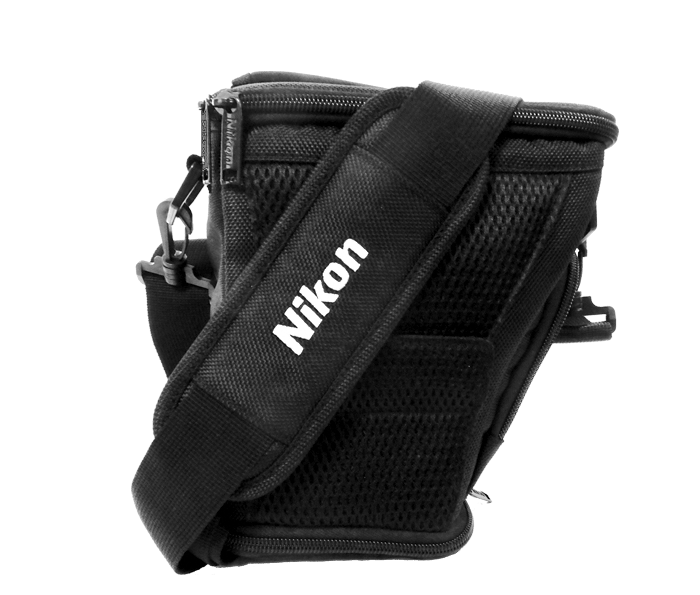 The Nikon Holster Bag is a holster style bag, black in color with the name Nikon embroidered in white, designed for specific bridge zoom and DSLR cameras with a telephoto lens attached. The bag is made of durable materials and has a comfortable handle as well as a long shoulder strap for flexibility. Features of the bag include two SD card pockets, an interior pocket, exterior zippered pocket and exterior slip in pockets. The Holster Bag also features a zippered extendable bottom that allows you to expand the size of the bag. A soft grey interior keeps your camera protected when not in use. The back of the case can be connected to a backpack for further convenience in carrying. Dimensions (Length x Width x Height): Approx. 10.5 x 7.5 x 5.5 in.